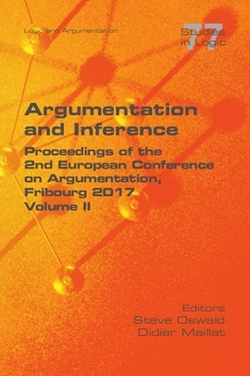 This is Volume II of the proceedings of the 2nd European Conference on Argumentation: Argumentation and Inference, held at the University of Fribourg, Switzerland, in June 2017. The European Conference on Argumentation (ECA) is an established pan-European initiative aiming to consolidate and advance various streaks of research into argumentation and reasoning: philosophy, communication, linguistics, discourse analysis, computer science, psychology, cognitive studies, legal theory, etc. These proceedings reflect the current state of the art of argumentation scholarship across these disciplines and, as such, are a testimony to the vigour of the field. A majority of contributions presented in these volumes frontally tackle the conference theme, thereby offering a valuable and focused discussion on various aspects of inference and on its role in argumentative practices to scholars interested in the topic but also, more broadly, in argumentation theory.